Turkish Strategy In Syria: Military Operations, Proxies And Idlib Issue 4.7272727272727 out of 5 based on 11 ratings. 11 user reviews. In order to understand Turkey’s approach toward the conflict in Syria, one first needs to explain the military situation there as of September 2018. 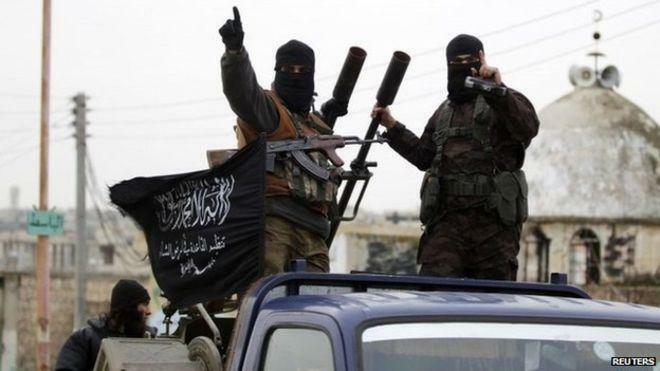 There are localized clashes between militant groups led by Hayat Tahrir al-Sham (formerly Jabhat al-Nusra, the Syrian branch of al-Qaeda) and the Syrian Arab Army (SAA) in northern Latakia and southern Idlib. The Syrian Arab Air Force and the Russian Aerospace Forces have recently carried out a series of strikes on weapons depots, equipment and UAV workshops and key facilities belonging to militants in southern and southwestern Idlib. These as well as deployment of additional SAA units at the contact line between the militant-held and government-held areas are described by pro-militant sources as clear sings of the upcoming SAA operation to defeat Hayat Tahrir al-Sham and other al-Qaeda-like factions there. The situation became especially complex following a September 17 announcement by Turkish and Russian Presidents that a 15-20km deep demilitarized zone between militants and government troops will be established in the Idlib de-escalation zone. All heavy weaponry, including battle tanks and artillery as well as hardline militants have to be withdrawn from the area before October 10 and the zone itself is set to be established before October 15. However, it’s still unclear how it’s possible without employing a military option to force radical militant groups, like Hayat Tahrir al-Sham, to obey. 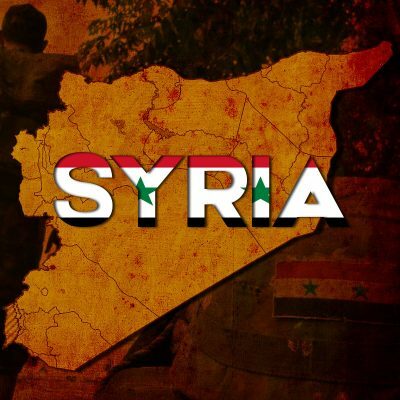 In Suweida and Rif Dimashq, the SAA is still working to eliminate ISIS cells operating in the desert area. Separate ISIS attacks on the SAA and the US-backed Syrian Democratic Forces (SDF) happen time to time. In those parts of Raqqa and Deir Ezzor provinces, which are controlled by the Kurdish-dominated SDF, the health care system has been totally destroyed, and no effort is being made to restore major infrastructure. Many of the areas under SDF control suffer from epidemics due to the shortage of clean water, and nearly total absence of medical services. The situation particularly bad, when it comes to restoring normal life and services. Local authorities, who should be involved in these matters, are mainly concerned with their own well-being. Kurdish leaders still view their main task as the creation of an independent enclave and later their own state in these territories. This is why their main concern is to keep the political and military dominance in the Arab-populated area. Negotiations between Damascus and the Kurds are continuing at a slow pace. The Kurdish political leadership are seeking to get concessions from Damascus, for example some kind of federation within Syria. Afrin, controlled by the Turkish Armed Forces (TAF) and Ankara proxies, is experiencing low-intensity guerilla war. Cells of the Kurdish People’s Protection Units (YPG) regularly carry out bombings and hit-and-run attacks on Turkey-led forces. The TAF has introduced additional security measures, increased the number of UAVs deployed and imposed practice of burning plots close to cities to react to YPG raids more quickly. However, the YPG continues a limited partisan war in Afrin, but without having sufficient forces to return it to own control. At the regional level, Ankara wants to position itself as the most important player in the matter of resolving the Syrian crisis. Turkey is actively supporting only those formations in Syria, which are loyal to and affiliated with it. The purpose is to turn Syria into a country loyal to Turkey, to neutralize Kurdish armed formations, to replace the Assad government, and to create a reliable pathway for energy supplies, especially oil, to Turkey. To achieve these goals, Ankara is using the rhetoric of counter-terrorism, though in reality it will support any organization ready to help to achieve its goals. The first is to deal with Kurdish armed formations in northern Syria. Turkey is directly fighting Kurdish armed groups in northern Syria, mainly the YPG. The YPG is the core of the US-backed SDF. At the same time, the YPG is linked to the Kurdistan Workers’ Party (PKK) both military and politically. [the YPG’s political wing, the PYD, is part of the Kurdistan Communities Union (also known KCK) together with PKK] Turkey alongside with the US and many other states consider the PKK as a terrorist group. Despite this, the YPG and the PYD as a dominating part of the SDF receive support from the US. The announcement that SDF bases would be used to prepare so-called “border security forces” (BSF), which would protect SDF/YPG-occupied parts of Syria, provoked a sharply negative reaction in Ankara, which accused the US of creating a “terrorist army” on the border with Turkey. If the BSF is successfully established, it would become an important step of the PYD/YPG, backed by the US, en route to establish a Kurdish semi-independent state within Syrian territory. This scenario is unacceptable for Turkey because such a state will pose a direct threat to its national security because of deep ties between the PYD/YPG and the PKK. This became one of the key reasons behind Turkey’s Operation Olive Branch against the YPG in the Syrian area of Afrin. Ahead of the operation the PYD/YPG leadership in Afrin has got multiple suggestions from the Damascus government to settle the situation by a peaceful way allowing the Syrian Army to deploy on the border with Turkey thus preventing the operation. However, all these suggestions have been rejected. After the start of the Turkish operation, the PYD accused Russia of colluding with Ankara to harm the Kurdish population. From January 20 to March 24, 2018, the TAF and Turkish-backed militant groups delivered a devastating blow to the YPG in Afrin and captured most of the area. Most of the YPG members and their supporters had fled to the government-controlled part of Aleppo province. The Turkish advance stopped when its forces reached positions of the Syrian Army. This was the second Turkish military operation carried out in northern Syria. The first one, dubbed Operation Euphrates Shield, took place in the al-Bab-Azaz-Jarabulus triangle from August 24, 2016 to March 29, 2017. The operation followed an attempt by Kurdish armed factions to link up their areas in northwestern and northeastern Syria and put an end to these plans. The PYD is the most influential, but not the only Kurdish political party in northern Syria. In January 2018 the PYD did not participate in the Russian-backed Sochi Congress for Syrian Dialogue. Turkey was against this, though it approved presence of another Syrian Kurdish political party – the Kurdish National Council (ENKS). The second goal is to keep and expand influence in the province of Idlib. The TAF started entering the province in October 2017 in the framework of the de-escalation zone agreement reached by Ankara, Teheran and Moscow in the Astana talks format. Since then, they have established 12 observation posts in the de-escalation zone. Russia have established 10 and Iran 7 posts near the de-escalation zone under the same agreement. 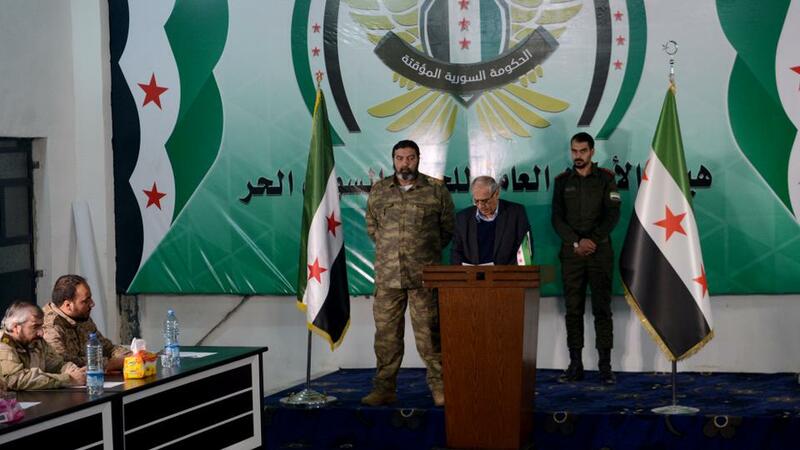 On May 28, 2018, 11 groups within the Turkish-backed part of the Free Syrian Army (FSA) announced the creation of the National Liberation Front (NLF) also known as Jabhat al-Wataniya lil-Tahrir. The merger was announced by Faylaq-al-Sham, the 1st and 2nd Coastal Divisions, the 1st Infantry Division, the Free Idlib Army, Jaysh al-Nasr, the Second Army, Jaysh al-Nukhba, Liwaal-Shuhdaal-Islam, Liwa Al-Hur and the 23rd Division. The NLF is headed by Faylaq-al-Sham leader, Colonel Fadlallahаl-Haji. On the same day, an NLF official announced that the Turkey-created force will take over the Idlib de-escalation zone. Russia, Turkey, and Iran will monitor the situation for 6-12 months, after which a new phase will follow. All the groups in the region will be disbanded and a single army on the basis of the NLF will be created. Idlib will be governed by local Turkish-controlled councils with minimal influence from Russia and Iran, said Omar Khatzayafah. Turkish forces and their proxies have contributed no efforts to combat Hayat Tahrir al-Sham influence, which is excluded from the de-escalation. In turn, it is carrying out active attempts to increase its influence in area and save the core of the anti-Assad forces. According to available data, Turkey is conducting active negotiations with the group’s leader, Abu Muhammed al-Julani, in an attempt to convince him to rebrand the group once again and merge with the Turkey-led “opposition”. Ankara also allowed the NFL and Hayat Tahrir al-Sham to carry out a large-scale crackdown on public figures, field commanders and activists supporting an idea of possible peaceful reconciliation with the Damascus government. At the same time, the security situation in the militant-controlled part of Idlib province remains poor. Over the past few months, the area has been hit by multiple bombings and assassinations aimed at both civilian and militant targets. When the Syrian conflict began, Turkey turned its own territory, particularly the border zone, into infrastructure used to this day by armed formations for training, rest, and medical support. The Istanbul-Gaziantep route, unofficially dubbed the “jihad-express”, was the main stream of jihadists heading for Syria in 2014-16. The Kilis-Azaz border crossing was also a major logistical hub for militants moving to Syria. Moreover, many Turkish border settlements were de-facto bases where militants were assembled and prepared for crossing the border. A letter dated March 15, 2013 and signed by Turkey’s Minister of the Interior Muammer Guler, stating that Hatay province was acquiring strategic importance in the context of the transfer of militants from Turkey to Syria, deserves separate treatment. The enabling of the movement within the region, the training and provision of medical aid to wounded fighters, and their crossing of the border into Syria, was mainly conducted through this province. According to the letter, Turkey’s National Intelligence Organization (MIT) and other organizations, which received corresponding authority, would coordinate the work with Hatay province leadership. When transitioning fighters through Hatay using land or air transport and with the participation of various civilian entities, heightened security measures were required. The letter notes that it is advantageous to place the fighters in hostels run by the Ministry of Religious Affairs and government hotels in the province, on direct instructions from the MIT. Similar letters were sent to the Mardin, Urfa, and Antepe provinces. Hatay hosts the camp for SAA deserters in Apaidin, only 2km from the Syrian border. In September 2012, this camp was considered the FSA headquarters, according to Mehmet Ali Ediboglu, a member of the Republican People’s Party. At that time, there were about 300 former Syrian soldiers and police, including about 30 generals, in the camp. In September 2013, a Deutsche Welle report mentioned that hundreds of fighters from Al-Qaeda-affiliated organizations were delivered by Turkish ambulances from Syria to the Ceylinpinar hospital, and those who suffered more serious wounds were delivered to the Balikdigol hospital in Sanliurfa province. In August 2014, the Daily Mail published an article about the border town of Reyhanli, which was part of the pipeline for militants into Syria and where Turkish border guards turned a blind eye. ISIS militants rested in the city itself before crossing the border, military uniforms, and possibly also weapons, were being sold right on the streets. Starting in March 2015, “Syrian rebels” were trained with the help of US and Turkish soldiers at a base in Kirsehir in central Turkey. The US announced that they would fight against ISIS, but representatives of the Turkish opposition said that the trained militants would mainly fight against the Assad government. The Turkish authorities confirmed in March 2015 the fact of a wounded ISIS field commander, who was a Turkish citizen, undergoing treatment in the hospital in Denizli. As of 2016, the city of Antalya in Hatay hosted a training camp for FSA members, who were fighting participating in Operation Euphrates Shield. The media more than once reported the presence of a training camp for “rebels” in Adana province, 8km from the Incirlik airbase. Turkish air force officials did not comment on these reports, and journalists had no access to the base. The official justification of this approach was that the refugees and opposition fighters ought to have free movement across the border. Two main forces capitalizing on this situation were Jabhat al-Nusra (now known as Hayat Tahrir al-Sham) and ISIS receiving recruits, funds and weapons through Turkish territory. Furthermore, Ankara’s ties to these groups are based not only on fighting Assad, but also on economic relations, and neither Turkish soldiers nor intelligence professionals have any illusions concerning this situation. It’s also telling that since the start of the conflict, Turkey has sharply increased the intake of water from the Euphrates, which soon caused many Syrian cities and villages to suffer from serious shortages. As soon as the SDF took control of northeastern Syria, the intake of water reached its maximum levels. However, when ISIS was in control of this area, Turkey was keeping the water and electricity supply. Another major feature of the Turkish collaboration with ISIS was the matter of the security of the Tomb of Suleyman Shah, which caused disagreements among the hardened Islamists within ISIS, since in their interpretation of Islam, adoration of the dead is a sign of lack of belief and of polytheism. However, for some reason the tomb was jointly guarded by ISIS militants and Turkish soldiers. One can say with absolute certainty that there existed an agreement which assigned ISIS the role of protectors in exchange for free movement of militants from Turkey to Syria and back. More evidence is provided by interviews with ISIS fighters captured by the SDF. One of them was a Libyan named Osman. He was first sent on a short 22-day initial training in Bani-Valid, Libya. Then he was trained with other ISIS recruits in Misrata for 25 days. Days before the graduation Osman was hit from a PKM by a “comrade in arms”, which meant spending another 22 days in Misrata hospital. During that time he was given a fake Libyan passport and sent for treatment in Medicana International, a large Turkish hospital in the Melik Duzu quarter of Istanbul. Osman confirmed the existence of an air corridor from Libya to Turkey for ISIS militants from Africa, Tunisia, and other Maghreb countries, who wished to join their “brothers” in Syria. Wounded fighters were sent from Libya to Turkey on a private plane. “We were helped during boarding,” said Osman. Then I realized that everyone else is also severely wounded, some are even paralyzed.” At the Ataturk Airport in Istanbul ISIS fighters were met by ambulances. Soon all the wounded were placed in Turkish hospitals. “We were loaded singly and in pairs, after which I found myself at Medicana International”. Osman said that all ISIS movements are under Turkish intelligence oversight. They are also concerned with ensuring the wounded militants’ security. “I once had to be examined by a neurologist, for which I had to be transported to a different hospital. On the way to the hospital I was accompanied by two intelligence officers, armed with pistols.” After the treatment which took another 4 months, he was brought to a hotel close to the hospital, then to a house in the European part of Istanbul. Three days later he was contacted by a militant called Abu Masab al-Iraqi, and they met in the Ibrahim Khalil quarter of the city where he and other mercenaries were told they were going to get tickets for a plane to Urfu. Many ISIS militants and their families and children had already assembled there. Osman indicated the particular importance of two cities, Tel Abyad and Jarablus, in supplying ISIS. This corridor funneled the biggest influx of mercenaries from Turkey to Syria under the supervision of Turkish intelligence and the army. In addition to fighters, it was also used to ship weapons, munitions and uniforms. Israeli military intelligence head, Major-General Aviv Kochavi said in January 2014 that the cities of Karaman, Osmaniye, and Sanliurfa house Al-Qaeda camps, which are also used as staging points. After the start of the Russian military operation in Syria, and multiple public revelations of Turkish links to the terrorists, like participation in the ISIS oil business, free movement of these terrorists across the border ceased. Otherwise the Erdogan government would have become a public sponsor of terrorism, which was unacceptable for Erdogan’s image. But the main reason for the closure of the border crossing was the series of defeats ISIS and Jabhat al-Nusra suffered, Turkey’s re-evaluation of its strategy in Syria under Russian pressure, and a reduction in the flow of refugees. Turkey currently uses a whole range of military instruments to advance its interests. During Operation Olive Branch in January-March 2018, Turkey involved 12 following groups as a core of its proxy force: the Hamza Division, Liwa Sultan Murad, Faylaq ash-Sham, Jaysh al-Nasr, Jaysh al-Nukhba, Jabhat al-Aisalat wal-Tanmia, the 23rd Division, the 1st Coastal Division, the 2nd Coastal Division, the Free Idlib Army, the 2nd Army and Liwa Shuhada al-Islam. An estimated manpower of these groups is 31,200. Besides this, the operation also involved fighters from other groups, like Ahrar al-Sham, the Sham Legion and others. Some of these groups are now part of the National Liberation Front, created in an attempt to boost combat potential and numeric strength of pro-Turkey bloc in the province of Idlib. HINT: A few words about the National Liberation Front in the context of Turkish policy. 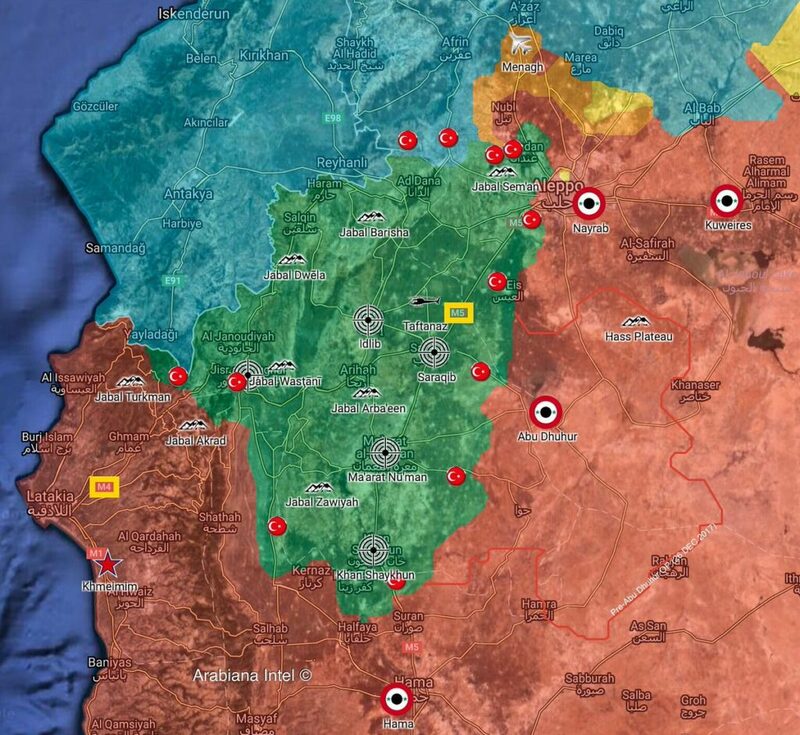 It is yet another attempt by Ankara to take control of a region which is the most problem-ridden de-escalation zone (Idlib), and where al-Qaeda jihadists from HTS have much influence. In the event of direct fighting against HTS, Turkey would face the risk of being bogged down in a prolonged, hard campaign. Turkish troops already have negative experiences associated with Euphrates Shield, where Turkish forces and allied Syrian militants had difficulty in expelling ISIS out of Al-Bab, suffering heavy personnel and equipment losses. In the event of an NLF success in Idlib, Turkey would avoid unnecessary losses and obtain the means of waging military operations ostensibly using a proxy. Moreover, Turkey would also get a “bridgehead” in Syria, which could be used to effectively influence the course of the conflict and the development of the situation in northern Syria. Apart from that, the presence of NLF formations has economic significance. They protect the Aleppo-Hama road, which is the commercial route from Turkey to Jordan and to Persian Gulf states. Some of these goods will remain in Syria. With Syrian industry destroyed, Turkish goods can achieve dominance. Another entity created in order to overcome the divisions plaguing the many groups controlled by Ankara is the Syrian National Army (SNA). It was intended to serve as a force against Hayat Tahrir al-Sham in Idlib if negotiations between Turkey and the group fail. The SNA will also participate in operations against Kurdish armed groups and will be responsible for consolidating the territories captured by Turkey-led forces. Finally, the creation of the SNA is an effort to re-brand so-called democratic activists after they have tarnished their image with war crimes or with collaboration with Hayat Tahrir al-Sham. As of today, the SNA is mainly operating in the al-Bab-Azaz-Jarabulus triangle and in Afrin. When operations in northern Syria are complete, all SNA forces from Jarablus to Idlib should be under a single command. The main force of the SNA are its 1, 2, and 3 Corps. The SNA formation is proceeding parallel to that of the National Liberation Front. The SNA, formed on May 30, 2017 as a separate force from the FSA, is a new army divided into three corps, consisting of 36 opposition groups under the aegis of the FSA. As of January 2018, it was still being formed and included 25,000 members. 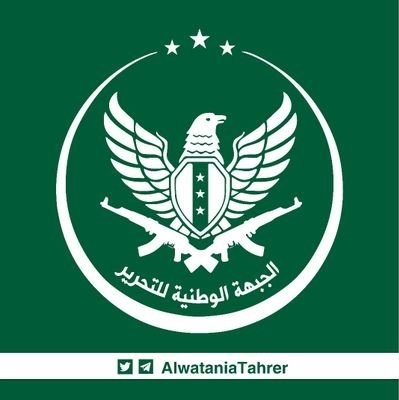 The SNA has received and is receiving support from Liwa Suquoral-Shimal, Ahraral-Sharqiyya, Jaysh al-Nukhba, Faylaq ash-Sham, Liwa Sultan Suleiman Shah, Liwa Sultan Mehmed Fatih, Liwa al-Vakkas, Jabhat Shamiyah, Liwa Muntassir Billah, Liwa Sultan Murad, Jayshal-Shimal, Liwa Samarkand, the 23rd Division, the 9th Division, Fevjal-Mustafa, Liwaal-Awwal al-Magahaweer, Liwa Usudul-Fatiheen, Jayshal-Ahfad, Festaqem Kema Umrit, the Hamza Division, Liwa Asifat Hazm, Jabhat al-Aisalat wal-Tanmia, Jayshal-Nasr, Liwa Hasakah Shield, Jaysh al-Sharqiyya, Liwaal-Fatih, Liwa Sultan Osman, Rejalal-Harb, Liwa al-Shimal, the 5th Regiment, Jaysh al-Thani and Tacammu Adl. The first reports of the Turkey-controlled Free Syrian Police (FSP) appeared in January 2017. Police units were formed in Jarablus as part of Operation Euphrates Shield, in order to help the FSA in their rear areas. By October 25, 2017, the Turkey Police Academy had graduated 5,631 Syrian police officers in 5 different schools, according to Anadolu Agency police sources. Syrian policemen were trained to provide security and protection in regions covered by the operation. Some 20% of the participants received SWAT training. In the autumn of 2018, the situation in Idlib and nearby militant-held areas become the main point of attention of the international media covering the conflict in Syria. The rationale for Turkey’s collaboration with Idlib armed groups is the desire to expand its own influence, while preserving the radical segment of these formations as a shock force to continue exerting pressure on the Assad government, Iran and Russia. The future of small groups not included in the above categories due to their links with ISIS and al-Qaeda (for example, the remnants of Jund al-Aqsa or Hilf Nusrat al-Islam) is yet to be determined. ISIS cells in Idlib. Turkey and its local allies have been fighting them with varying success. The problem is that, ideologically, the core of pro-Turkish groups and their allies is quite similar to ISIS. This is made worse by the horrifying level of corruption in and violence by the security forces of Hayat Tahrir al-Sham and the Syrian Liberation Front, which are the only forces capable of relatively significant action against ISIS cells. Hayat Tahrir al-Sham remains the dominant military force in Idlib, alongside the Syrian Liberation Front. The problem of the Turkish approach is that the stronger the force, the harder it is to control it “behind closed doors” without offering guarantees. Hence various “PR armies” such as the SNA. While sabotaging the fight against terrorists, Ankara is strenuously pretending it is forming the “moderate opposition”. In the short term the odds of the pro-Turkey “moderate opposition” defeating terrorism in Idlib with Ankara’s help are minimal. The Turkish stance toward a possible military operation against Hayat Tahrir al-Sham and its allies in Idlib by the Syrian-Iranian-Russian alliance is proof of it, if additional proof were needed. The total amount of financing provided to militant groups in Syria from Turkey has never been assessed, but it’s in the tens if not hundreds of millions of dollars a year. It has varied at different stages of conflict, and was disbursed through various sources. In 2012-2016, the main source of financing was aid from foreign sponsors. Ankara was not too shy to use funds from the US, Persian Gulf monarchies, domestic or foreign volunteers supporting these or other groups. One should also include the CIA program worth $500 million to train “Syrian insurgents”. The 2015-16 migration crisis led to EU-Turkey negotiations on financial aid to Ankara, in return for which Turkey housed the refugees. Turkey asked for €30 billion up front, to be followed by annual payments of €3 billion, but it’s not known how much Turkey actually received, though there was an agreement on €3 billion in 2016 and another €3 by 2018. Considering the numerous world media reports on the terrible conditions for refugees in Turkey, it’s likely the money is mostly being used to finance groups fighting Assad, while refugees are given the lowest priority. Moreover, the Turkish Ministry of Defense and the MIT probably have budget items which are used to finance armed groups, though these would obviously be classified. As the flow of jihadists and activities of volunteers declined, opposition groups fighting in Syria apparently shifted to self-sufficiency, which looks as follows: Turkey provides weapons, munitions, equipment, transportation and training. In return it receives resources from the occupied territory—oil, agricultural and industrial products. The priority is given to Turkey-manufactured goods in trade on occupied territory. Turkey also continues to play the role of a clearing house for financing, though now to a lesser extent. One should note the widespread hawala system, an informal financial accounting system which is based on a balance of mutual credits and obligations among brokers and which is widespread in Muslim countries. The Money Services Business is also widespread in Turkey. What they all have in common is an absence of accounting transparency as understood in the West. For example: during a chat on Whats App or another messenger, an individual raising funds indicates the transfer should take place through an entity working with Western Union in Turkey. The recommended contribution varies from $500 and $9500, can be repeated, and is difficult to track. The fund-raiser provides contact information and asks the sponsor to provide a secret code after the transfer in order to collect the money in a town on the Syrian border. Turkey uses various range of ideologically divided groups ranging from neo-osmanist and pan-turkic to ultra-radical Islamist ones, which are incompatible with the current Syrian government. This shows that in order to fulfill his own political ambitions, Erdogan is ready to make alliances with almost anybody who may serve his interests. According to UNHCR, in April 2018 there were 3.9 million refugees from Syria in Turkey. Such a number of people cannot help but attract the attention of the Turkish military and intelligence for the purpose of ideological indoctrination and recruitment to fight a war for the new Syria, as envisioned by Erdogan. Hamza Division. Syrian nationalism. It numbered about 2,200 in September 2017 according to its own reports, and consists mostly of Arabs, Syrian Turkmen, and Kurds. It has its HQ in Mare, Aleppo province, where it operates and its commander in September 2017 was Abdullah Halawa. It cooperates with the Northern Thunder Brigade, the Mare’ Resistance Brigade, the Special Operations Brigade, the Dhi Qar Brigade and the Kurdish Falcons Brigade. Liwa Sultan Murad. Pan-Turkishm. In 2016, it claimed to have 1,300 troops in 2016, mostly Syrian Turkmen and Arabs. Together with other Turkmen organizations, such as Liwa Sultan Suleiman Shah, Liwa Sultan Mehmed Fatih and Liwa Sultan Osman, it forms the Sultan Murad bloc. According to Turkish sources, Liwa Sultan Mehmed Fatih units undergo training in Turkey itself, though the location of the camp is unknown. It has its HQ in Al-Bab, Aleppo province. The commander as of November 2017 was Mahmoud al-Hajj Hassan. Faylaq ash-Sham. Salafism. It has about 4,000 members, mostly Arabs. It’s based in Aleppo province, but its zone of responsibility also includes Idlib, Latakia, Hama, and Homs provinces. The commander as of early 2018 was Yasser Abdul Rahim, who was a key field commander during Operation Olive Branch. In February 2018 he was replaced by Khaldun Mador, and currently the commander is Colonel Fadlallahal-Haji. This formation served as the base for the National Liberation Front and the commander of Faylaq ash-Sham became the commander of this new formation. In June 2018 it was joined by Liwa Shuhada al-Islam, who numbers 799. It collaborates with the Army of Mujahideen, the Muslim Brotherhood of Syria, and there are reports of close collaboration with Hayat Tahrir al-Sham. Jaysh al-Nasr. Salafism. It had 5,000 members, mainly Arabs, as of 2015. Its HQ is in Qalaatal-Madiq, Hama province and its zone of responsibility includes Idlib, Latakia, Hama, and Aleppo provinces. It was commanded by Muhammad Mansour as of early 2018. With the formation of National Liberation Front, Mansour became its deputy commander and chief of staff. The group collaborates closely with Tahrir al-Sham, Jaysh al-Izza and Ahrar ash-Sham. Jaysh al-Nukhba. It collaborates with groups pursuing Syrian nationalism and Salafism. Its strength was 3,000, mostly Arabs, as of early 2017, according to its own statements. Its Aleppo province HQ is located in Jarablus, its Idlib province HQ in Kafr Nabl, and its zone of responsibility covers Idlib, Latakia, Hama, and Aleppo provinces. This formation is part of the Hawar Kilis Operations Room, the biggest pro-Turkey FSA group. It was commanded by Mohammed Ahmedal-Sayed in early 2017 and collaborates with Jaysh al-Nasr, Ahrar ash-Sham and the Free Idlib Army. Jabhat al-Aisalat wal-Tanmia. Salafism. It had 5,000 members, mostly Arabs, in late 2015. Its zone of responsibility is Aleppo province and it is part of the Hawar Kilis Operations Room. The group collaborates with Jaysh al-Islam and Ahrar ash-Sham. 23rd Division. Islamic democracy. It numbered 1,400, mostly Arabs, in late 2014. Its HQ is in Qah, Idlib province and its zone of responsibility covers the northern Idlib and Aleppo provinces. Commanded by Abu Mustafa in early 2018, it collaborates with Ahrar ash-Sham, the Nour al-Din al-Zenki Movement and Festaqem Kema Umrit. 1st Coastal Division. Pan-Turkism. 2800 strong in 2015, it is made up of mostly Syrian Turkmen and Arabs. Its zone of responsibility covers Idlib and Latakia and as of 2014 its commander was Muhammad Haj Ali. It collaborates closely with Tahrir al-Sham, Ahrar ash-Sham and the Turkistan Islamic Party. 2nd Coastal Division. Pan-Turkism. It numbered around 500, mostly Syrian Turkmen, in 2015. 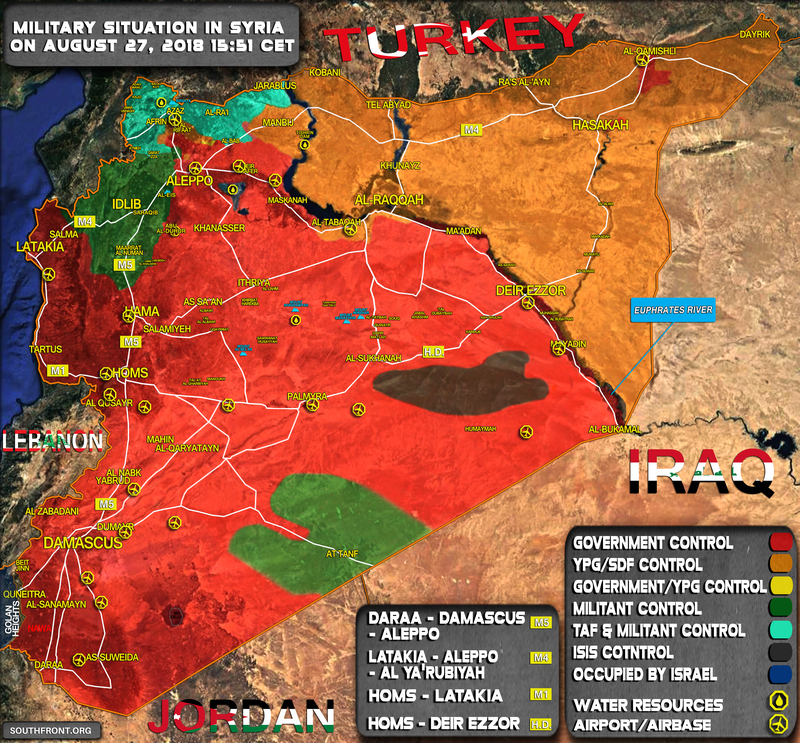 Its zone of responsibility includes Aleppo and Latakia and its commander is Tarik Solak. It collaborates closely with Hayat Tahrir al-Sham (in the province of Latakia) and Ahrar ash-Sham. 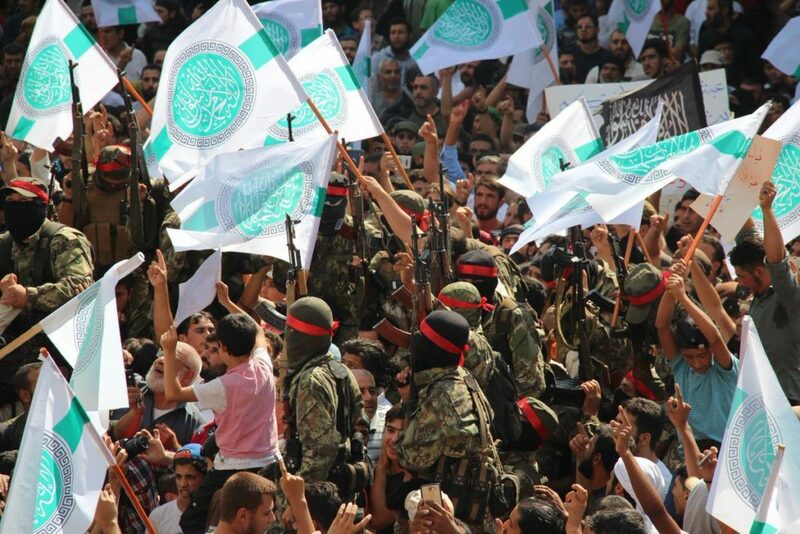 Free Idlib Army. Syrian nationalism. According to its own account it numbered around 6000, mostly Arabs, in 2016. It has headquarters in the towns of Maaratal-Numaan and Kafr Nabal in the province of Idlib. Its zone of responsibility covers the provinces of Idlib, Latakia and Aleppo. It includes the 13th Division, the Northern Division and the Mountain Hawks Brigade. Currently they are commanded by Suhaib Leoush. They collaborate closely with Hayat Tahrir al-Sham, Ahrar ash-Sham and Faylaq ash-Sham. 2nd Army. Syrian nationalism and Islamic democracy. In June 2017 it counted around 1500 members, mostly Arabs. Its zone of responsibility covers Idlib, Latakia and Hama. It includes Division 46, Division 312, and Division 314 and its commander in June 2017 was Mohammed Khaled Khleif. There are reports that they have fought with ISIS in the North of Syria. Liwa Shuhda al-Islam. Moderate Islam. It had around 700 members, mostly Arabs, in June 2017. Its HQ is in Idlib, Hama and Rif Dimashq. Its commander, Saeed Naqrash, was captured by unknown individuals in April 2018. The group blames Tahrir al-Sham for the kidnapping, which they deny. There are reports of close collaboration with the Islamic Union of the Soldiers of the Levant. Northern Syria is a big knot of contradictions, with every party (Syria, Turkey, Iran, Russia, and of course the US) seeking to implement their own plans. The Assad government is still viewed as illegitimate by Ankara, though Erdogan prefers not to mention it officially if this is possible. Turkish authorities have also repeatedly claimed that Ankara is fulfilling its obligations under the de-escalation zones agreement. However, no practical steps have been made by Ankara to separate Turkish-backed “moderate” factions from the terrorist groups in Idlib or to combat the terrorists there. Turkey considered ISIS and Kurdish armed groups to be terrorists. After ISIS suffered defeat, Kurdish armed groups remained the only point in that category. Some Kurdish leaders hoped that Erdogan may lose the presidential election and thus the Turkish stance on the Kurdish issue in northern Syria will soften. However, this has never happened. On June 4, 2018, Ankara and Washington approved the “road map” for the town of Manbij in northern Aleppo, which is currently controlled by the Kurdish-dominated SDF. According to Turkey’s Foreign Minister Mevlut Cavusoglu, the first phase of the “road map” would see a withdrawal of Kurdish units from the town, which would come under joint patrols of Turkish and US troops. Turkish top officials also claimed that the agreement implied creating a town administration out of local inhabitants after the Kurdish armed groups’ departure. Turkey also insisted that all Kurdish armed groups within the SDF have to be disarmed or even disbanded in the framework of the roadmap. Nonetheless, the turn of events appeared to be at odds with Ankara’s desires. The YPG once again claimed that it had withdrawn its members from Manbij. US and Turkish forces started patrols north of the town, on the contact line between the SDF/YPG and Turkish-held areas. No Turkish troops entered Manbij. The political and military control over the town remained in the hands of the YPG-affiliated bodies. Furthermore, the US continued providing Kurdish fighters with various military supplies, including weapons and armoured vehicles, and training. No further joint US-Turkish steps to settle the Manbij issue in favor of the Erdogan government were made. Moreover, the problem is also that for Erdogan, Afrin, Al-Bab, and Manbij are not enough. He has repeatedly vowed to completely clear Kurish armed groups from the area from Manbij to Sinjar, which means operations in Qamishli, Kobani and Haskah, the main YPG strongholds in Syria. Thus, in order to achieve own goals the Erdogan government is balancing between the US-led bloc and the Syrian-Iranian-Russian alliance. From Russia’s point of view, the strategic priority is Syria’s territorial integrity and the prevention of radical islamists from coming to power. Russia is open to dialogue with a moderate part of the Syrian opposition and is ready to participate in the talks. The leadership likely understands that Turkey is a temporary ally of Russia in Syria, where the two countries together with Iran are guaranteeing the ceasefire in de-escalation zones. Thus, some Russian experts claim that Turkey is allied with the US against Russia, which does have some basis. Turkey is in NATO, Ankara has supported and is still supporting the opposition, especially radical armed groups in Idlib, which are not willing to negotiate with Assad. The conflict of objectives between Turkey and the Syrian-Iranian-Russian alliance has become obvious when the SAA started preparing for a possible military operation in Idlib. However, Turkey’s, Syria’s, and therefore also Russia’s interests coincide on the question of Syrian Kurdistan. After Russian forces were dispatched to Syria and particularly after the liberation of Aleppo in 2017, Moscow tried to act as an intermediary between the Kurds and Damascus, trying to convince the latter to create Kurdish autonomy. But the Kurdish leaders rejected talks with Damascus and instead placed their hopes in an alliance with the US. It does not matter whether they picked that option because they felt Washington was the best hope to gain quick independence for Rojava or because of a cash stimulus from US emissaries. Most likely both factors played a role. The prospect of a pro-US Kurdish “independent” state formation was extremely worrisome to Ankara, Damascus, and Tehran, prompting them to close ranks. Thus, the Kurds have lost their chance to get a wide autonomy within Syria and become a bargaining chip in the negotiations between major players involved in the conflict. The Astana process format also deserves a few words. In the framework of this formant, Russia, Turkey, and Iran have affirmed their determination to fight terrorism and also those organizations which are considered terrorist by the UNSC, oppose separatism aimed at undermining territorial integrity and the sovereignty of Syria and the security of neighboring countries, continue joint efforts to promote political reconciliation among the Syrians themselves in order to facilitate the earliest possible launch of the Constitutional Committee in Geneva. But the actual situation is radically different. Ankara de-facto controls part of Syria, with the fight against Kurdish armed groups and the expansion of own influence in the war-torn country being the motives. Turkey also lacks a UNSC mandate or a permission from Damascus to deploy forces in the country. These are undoubtedly violations of Ankara’s commitments to the Astana agreements and of Syria’s sovereignty. The participation of the Syrian opposition in the negotiations is also a problem. Many factions just sabotage the talks. Moreover, there are no significant results in the realm of political decisions on the country’s future, even though they sides continue to affirm their unity in this effort. One could draw the conclusion that the Astana format is not effective and is only a platform for meetings among heads of states, since each country and Turkey in particular is pursuing its own interests. If one examines Russian participation in the conflict, there is still no evidence that Russia plans to impose a solution for a future Syria by force. Troops and equipment are being withdrawn from Hmeimim, which indicates a gradual drawdown of the military operation and a shift towards diplomatic means. However, while it’s possible to observe the successful implementation of this approach in some separate regions of the country, it has faced significant difficulties on the regional level. The September 17 announcement of the demilitarized zone in northwestern Syria by President Putin and his Turkish counterpart are a part of the wider strategy aimed at reaching a kind of peaceful settlement to the conflict and to de-escalate the situation. The success of this effort now depends on the ability and willingness of the sides to employ the agreement on the ground and to force radical militants to demilitarize at least the 15-20km deep area. In the last decade, Turkey’s foreign policy underwent significant changes which transformed its theoretical and practical foundations. The term “neo-Ottomanism” was launched in the context of Turkey’s expanding international activities in the scientific and political realm. While the international community interprets it in a number of ways, it does contain a clear ideological component. Moreover, neo-Ottomanism is the most appropriate term to describe Turkey’s foreign policy ideology and actions. Ankara seeks to become a world power, and that goal drives its activities, particularly concerning the Arab Spring and the war in Syria. There are many potential clashes of interests between Turkey and Syria, including the Kurdish issue, mutual territorial claims, and ideological and political incompatibility. Since the very start of the protests in Syria, Turkey has rendered and continues to render help to the armed groups and political opposition. Moreover, the bilateral relations are made more complicated by the Euphrates river (nearly half the water is taken by Turkey which deprives countries downstream of water), the looting of industrial enterprises of the manufacturing center of Syria – Aleppo (equipment from nearly 1,000 factories were transported to Turkey). Ankara still believes Assad ought to leave his post, although in the last year its rhetoric concerning Assad’s legitimacy has softened. This was due to the growth of Russian influence on the theater of operations, military defeat suffered by several groups backed by Turkey, and also by the political and economic pressure exerted by Moscow after the Su-24 incident. This shaped Turkish policy toward Syria. 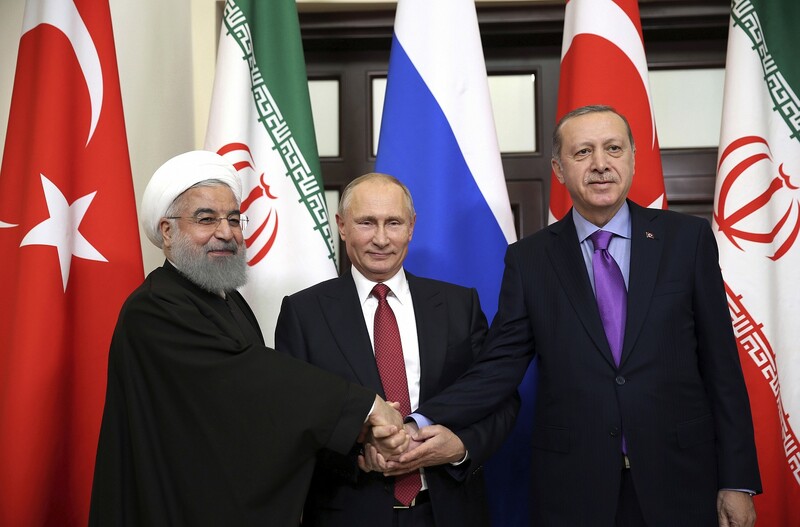 In the best outcome scenario for Syria, Iran, and Russia, Turkey would not plan to annex the Syrian territory it controls in the north of the country in order to avoid a negative reaction from these three states. These territories may be used as bargaining chips in order to gain preferential treatment for work in post-war Syria, thus expanding and strengthening its sphere of influence in that country and strengthening Turkey as a regional power. It’s possible that the Syrian border territories will see something akin to a trans-border protectorate, without redrawing national boundaries. Turkey has already transformed the agglomeration of its proxies into something like a unified opposition, with whom Ankara imagines Assad will discuss the future of Syria, thus giving it a place in the war-destroyed country and thus ensuring Turkey’s interests are safeguarded. If these goals are achieved, Ankara will significantly increase its influence on the diplomatic settlement of the crisis and on the future of the post-war Syria. The returned refugees and supporters of militant groups in the Turkish-controlled part of Syria will become an electoral base of pro-Turkish political figures and parties in case of the implementation of the peaceful scenario. If no wide-scale diplomatic deal on the conflict is reached, one must consider the possibility of a pro-Turkish quasi-state in northern Syria, confirming the thesis that Erdogan is seeking to build a neo-Ottoman empire. Erdogan only want to save his face!…He lost the Syrian war…and he need to show strength and power…creating a Pseudo kosovo inside Syria to protect FSA ( Idlib)…taking lands to Kurds in North( Afrin)…and coming soon in east Syria Kurdistan(Kobani)….but as I wrote before….only to save his face!… If SAA would have taken Idlib..and Kurds Northwest Aleppo and North east ( Al Bab)….Erdogan would have serious problems to keep in Power…. Nothing new..Kurds is another problem for Syria..as they seek a clon of Israel state…in that way.. mid east will have to states supported by USA to hit Arabs and Turks..IT is the Rojava state and Israel! Turkey’s huge problem is that when Syria destroys the militia, hundreds of thousands of trained soldiers will have to flee into Turkey. The whole southern border of Turkey becomes totally ungovernable, with the Kurds to the east and Turkmen to the west. Already they have for years had problems with autonomy claims from both groups. This war has provided experience and armaments for the rebels who would in any event rather take ground in Turkey than in Syria. Russia and Iran’s problem is that if they clobber Turkey (which would not be difficult) NATO automatically gets involved and WW3 is started. USA has Trump as it’s clown with his claim that his hands are the worlds biggest! He and all Americans want to just come home and rest for a while. The problem lies with the Oil corporations who would disintegrate without the threat of US forces to make Saudi, Kuwait, Mexico et al pay ransom. When Venezuela said no, they destroyed the country. When Russia said no, they tried really hard to destroy the country. Turkey knows that US as an ally, is as dependable as a cheesecloth condom. The EU would rather bomb Turkey than help it, and Russia still remembers that Turkey murdered one of it’s pilots. Erdogan is deep in the Doodoo. Erdogan ( Turkey) is simply one of the “useful Idiot s” along with Trump, Putin and all leaders of Western countries and those in the the Middle East. The “Jews” OWN the MONEY and the BANKS, so they will not go Broke. This will all end when Criminal Psychopathic Wealthy (Ashkenazi) JEWS rule. Maybe, considering Psychopathic Wealthy “Christians” ruled for over 1500 years, it is time for the Jews ???. When will we Atheist get out turn. OH, yeh, there are no Trillionaire Atheists. 1. Israel is acting as if it wants to challenge Russia directly. Let them have it. Deliver the S-300 to Syria. Mull the possible deployment of Russia’s “strategic weapons” and Russian “strategic forces” to Syria. Always invoke the need for peace and international order and never stop repeating and emphasizing the importance of adherence to international law, existing agreements and United Nations Security Council resolutions, always mention their numbers and, if possible, include their crucial provisions. Not only according to international law but also according to these peace agreements, Iran’s presence in Syria is part of these peacekeeping agreements for which the West and the EU has been calling so desperately. Thus, Israeli actions on Syrian territory directly contravene the declared will of the international community, thwarts it peacekeeping efforts and disrupts the process of national reconciliation in Syria. What a nice leverage against Israel on a global scale! Now the blame can rightfully be shifted onto them! 2. Of course, all of the above applies to he United States of Aggression as the main backers of Israeli interests in Syria, so I will not repeat it here. By the way, neither Israel, nor the United States of Aggression is a party to this process, they are outsiders, so they cannot claim any peacekeeping efforts; in fact, they have been made outcasts by this process. If it did not help, exploit it by calling international attention to the efforts of these bad-faith parties and to their foul acts and also by promoting global awareness of them… and take advantage of it it to sow discord among the Western partners in crime. 3. The article deals with Turkey, so i will limit myself in this regard.